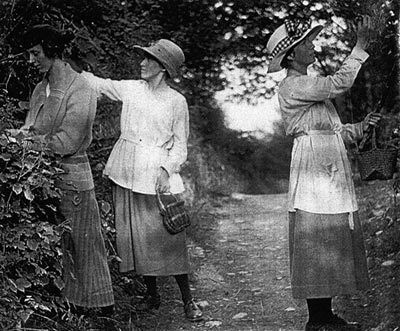 Blackberrying in Montgomeryshire c1920: Enid Lloyd-Morgan (later Varlow), Ceridwen Dilys Morgan and Margaret Gwenonwy Morgan (later Steele). Mwyara yn Sir Drefaldwyn c.1920: Enid Lloyd-Morgan (Varlow wedyn), Ceridwen Dilys Morgan a Margaret Gwenonwy Morgan (Steele wedyn). Archif Menywod Cymru / Women’s Archive of Wales exists to promote the study, and to rescue and preserve the sources, of women’s history in Wales. The task of recovering women’s history in Wales is urgent and pressing. Central to the reclamation of our distinctive history is the active process of tracking down, rescuing and conserving historical sources which throw light on women’s lives. We cannot reconstruct our past without authentic historical sources. We collect a broad range of archival, photographic and other material sources which illustrate the history and heritage of women in Wales, and their experience in a range of spheres including the domestic, political, religious, economic, cultural and social. We particularly seek diaries, scrapbooks, the minute books of women’s organisations, literary manuscripts, photographs and similar materials. Our collections are deposited in our name in existing record offices in Wales, and in the National Library of Wales, where they are properly cared for, and where they can be accessed by researchers (subject to any restrictions put on a collection). The collections range from single items to large collections of documents, photographs, newsletters and other material. Our aim is to rescue material of all kinds which relate to women’s lives in Wales and to ensure it is properly cared for and preserved. At present (2006), our collections are particularly strong in material relating to the women’s peace movement of the 1980s and 90s, and of the women’s liberation movement of the 1970s and 80s. A project, Archives Network Wales, is currently underway to document the main collections of archives and record offices in Wales, and when completed it should be possible to search for AMC / WAW collections throughout Wales. This archive entry was last updated on 5 November 2018. Information incorrect or out-of-date?